1st upside down 30% dull saguaro. a 1st 1.8 foot tall dull head is -.3 foot above and -1.7 foot right of the saguaro. 2nd upside down 30% dull saguaro is behind and -.5 foot right of the saguaro. a 2nd 1.8 foot tall dull head is -.3 foot above and -1.8 foot right of the saguaro. a 3rd upside down 30% dull saguaro is behind and -.5 foot left of the 1st saguaro. a 3rd 1.8 foot tall dull head is -.2 foot above and -1.8 foot right of the saguaro. the 3rd head's eyebrow is black. desert backdrop. sun is sea mist blue. 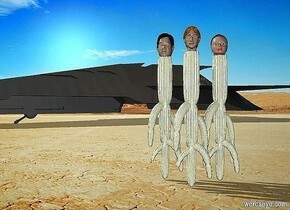 a big dull dark spaceship is 10 feet behind and -45 foot left of the saguaro. it faces southwest. 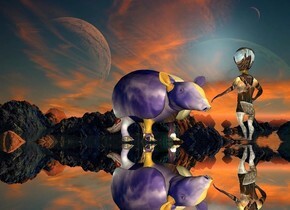 a face up mirror.the sky is fantasy.fantasy backdrop.a animal is on the mirror.the animal is fantasy.a 1 feet tall alien is 6 inches left of the animal.the alien is fantasy. The image backdrop.a humongous upside down bubble.a huge alien is behind the bubble.it is on the ground.the alien is facing northwest.a 70% yellow light is in front of the alien. 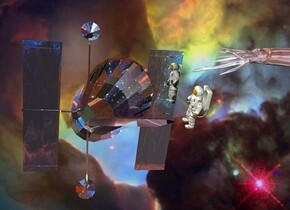 The image backdrop.a silver telescope.a man is right of the telescope.he is facing left.the man is leaning 45 degrees to the left.a large shiny squid is right of the man.it is facing the man.it is above the man.the sky is fantasy. It is night. The camera light is black. There is a very huge illuminator. There is a man. There is a very huge illuminator to the right side of the man. There is a very huge illuminator behind the man. There is a very huge illuminator above the man. 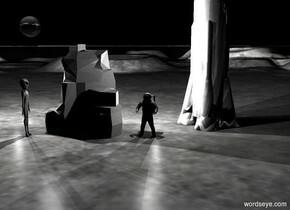 There is a small shiny planet seven feet above and fourteen feet to the left of the man. The planet is leaning 30 degrees to the right. The planet is 70% transparent. 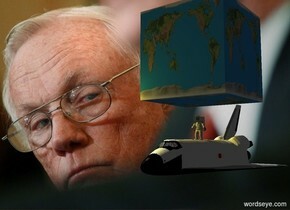 There is a black illuminator in front of the planet. There is a small 70% shiny grey rocket three feet behind and one foot to the right of the man. There is a huge black illuminator on the left side of the rocket. It is facing the rocket. There is a tiny grey rock two feet on the left side of the man. There is a small white illuminator above and on the left of the rock. 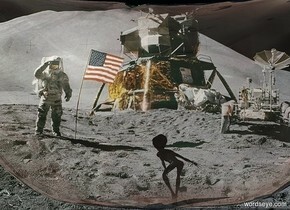 There is a big alien left of and in front of the rock.. He is facing the man. 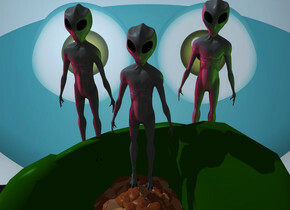 There is a black illuminator above the alien. 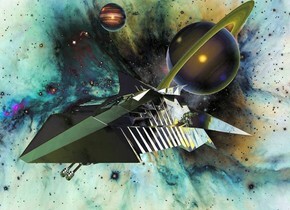 The image backdrop.a silver spaceship.a 1st giant planet is 12 feet behind the spaceship.it is leaning 45 degrees to the east.a blue light is 1 feet right of the 1st planet.a 2nd planet is 2 feet left of the 1st planet.it is -15 feet above the 1st planet.the spaceship is leaning 25 degrees to the left.